Every few weeks, Google reports an updated version mix of "all the devices that visited the Google Play Store in the prior 7 days." It depicts the breakdown for each major version as a percentage and depicts the numbers in a pie chart (similar to the one above on the left). Pie charts are typically selected to obscure the differences between different slices of a given pie. 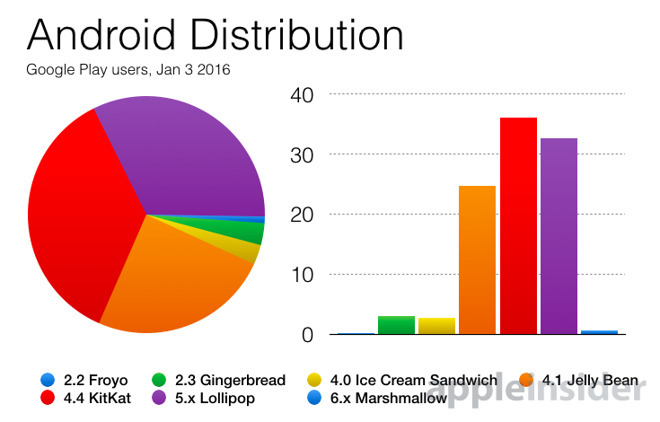 Despite this flattering portrayal, Google Play's Android version pie chart still makes it clear that only a tiny shard the active installed base of Android users are using the latest Marshmallow release, in stark contrast to Apple's similarly new iOS 9, which has already reached 75 percent of the installed base. Going back another year, just under a third of Google Play users are on 5.0 Lollipop. Travel back another year to the 2013 vintage of iOS 7, and Android 4.4 KitKat sits on 36 percent, despite its security issues. Go back another year to the days of iOS 6, and some version of Jelly Bean (introduced summer 2012) sits on another 25 percent of active Google Play user's devices. When you move the data from a pie to a column chart (shown above right), it further emphasizes just how old Android software really is in the wild, and the very difficult time Google has in solving the increasing issue of OS level fragmentation. One of the bigger issues is that Android's licensees and mobile carriers often see distributing updates as a low priority because they have no profit incentive to do so. If anything, the preparing, testing and delivery of updates costs money and other resources and offers users a disincentive against paying to upgrade to a new phone or other device. However, Google Play only represents users from one of the two largest smartphone markets in the world. Because all of Google's software services are blocked in mainland China, users in that massive market (currently the world's largest) are distributed between a series of third party download stores run by search engines, phone carriers and other vendors. Determined users in China can work around the national firewall that blocks access to Google Play, but that default barrier has left Google with access to only around 5 percent of the smartphone population, a position outside of the top 20 Android download stores, according to AppInChina. Google Play reportedly hopes to officially reenter China this year, but that will require battling Baidu, "China's Google," for attention, along with other established stores who have no intention of giving their market share away. That includes popular stores operated by social networks such as Tencent and the largest independent downloads store, 360 Mobile Assistant. Google will also face the uphill challenge of wresting users away from its licensees' own stores, such as those operated by Xiaomi, Huawei, Meizu and Lenovo (which those hardware makers count on to make up for minimal profits on hardware sales), as well as State-owned mobile carriers who operate their own Android stores, such as China Unicom and China Telecom. On top of the security issues related to "side-loading" stores that often cater to pirated apps and are full of aggressive malware and pervasive spyware schemes, Android users in China are also even less likely to get timely updates for their operating system. Android 5.0-5.1.1 is running on approximately 20% of all Android devices in China. Smartphones, tablets, smart TVs, etc. According to analyst Ben Bajarin of Creative Strategies on Twitter, "Android 5.0-5.1.1 is running on approximately 20% of all Android devices in China." In addition to reporting on China, Bajarin is also currently conducting a survey of Fitbit, Apple Watch and other smartwatch users in conjunction with Wristly.